I’ve now been living with a vegetarian for two years and it’s really rubbing off on me. The posts on this blog that feature meat are becoming few and far between. If I’m perfectly honest, I now get so nervous about cooking meat for other people that I will try, try and try a recipe over again to make sure that it is perfect. This weekend we had our friends Joe and Amy to stay. Both are meat eaters and Joe is a huge fan of a nice big steak so when I was trying to come up with plans for dinner I new I wanted to dish up something meaty. Beef Barbacoa was the perfect dish. This slow cooked beef recipe is oh so meaty. I chuck in a few black beans to convince myself there’s some goodness in there but it really is just meat, spices, meat, some more spices and then some more meat! A carnivores dream? Perhaps! I’m a huge fan of laid back hosting. When I shared my Top 20 Tips for Hosting a Dinner Party the intention was to prove that you can host a sophisticated dinner party without stressing yourself out and doing too much. With Amy and Joe coming to stay this weekend I decided to take the pressure off of myself by not only doing a Taco Bar for dinner, but by cooking the Beef Barbacoa long and slow in my slow cooker. By the time Amy and Joe arrived 90% of the dinner was cooked or prepared. All I had to do was pour the drinks and natter away. Easy. Now lets take a step back. What is Beef Barbacoa and why is it so good for tacos? 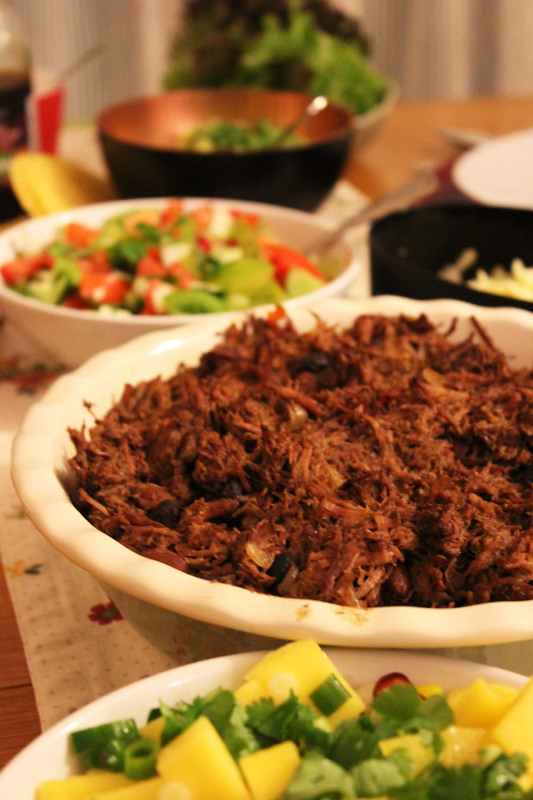 Barbacoa is the term used to describe slow cooked meat (often taken from the cheeks of the animal) and cooked with various spices for extra flavour. Believe it or not, this recipe is actually semi-authentic. Often I cook “Tex-Mex” rather than Mexican food but barbacoa is often served in Mexico on top of corn tortillas with salsa and guacamole – just like you can see on my taco bar here. Although in Mexico barbacoa is often made with lamb, I think the recipes works equally well (if not better) with beef. I take shoulder cuts of braising steak (one steak per person) and cook low and slow with diced white onion, cumin, oregano and lime (amongst other things). Served in the centre of the table, guests can then loads up tacos themselves with the Slow Cooked Beef Barbacoa and all of the trimmings. Cut the braising steak into cubes roughly 2 inches across and place into the slow cooker. Add the onion, garlic and other whole and dried spices before pouring over the cider vinegar, lime juice and stock. Add the lid to the slow cooker and turn to LOW. Cook for 6 - 8 hours. Using two forks, pull the beef apart into shreds. Turn the shredded beef out into a shallow oven dish and mix with the beans, season to taste before placing under the grill for 15 minutes until the beans are hot and the shredded beef has caramelised slightly. Serve immediately in crisp taco shells with all the trimmings. You can of course serve my Beef Barbacoa with whatever you like, but I recommend my tequila salsa which adds a real punch! I’m with you on the laid back hosting! It’s so much more fun to plan ahead and then get to enjoy guests. My husband and his family would love this!!! I really need a taco bar in my life right now. Lovely recipe.